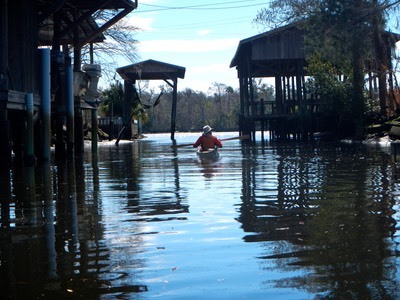 I had heard about the pleasures of paddling Cedar Key for many years. My friend and favorite outfitter, Scott Locorini of Adirondack Exposure runs popular lodge based trips out of Cedar Key each March. I was never able to participate in these trips while I lived up north. And it seemed silly to spend hundreds of dollars to do that trip once I had moved to Florida. 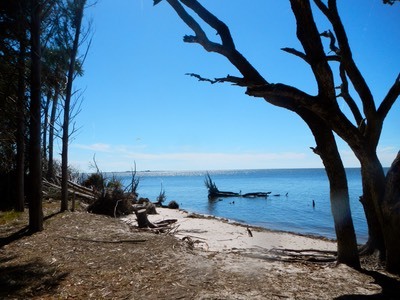 So when my buddy Bruce and I discussed where we might paddle in February 2102, we settled on Cedar Key. We were probably a month too early. Because Cedar Key is further north in the state than where I live and would be colder at night, we decided not to camp but to do a “lodge based” adventure. This turned out to be a good decision. I searched the internet and found a funky little establishment with individual efficiency cabins at what seemed like a ridiculously low rate ($74.00 per day). 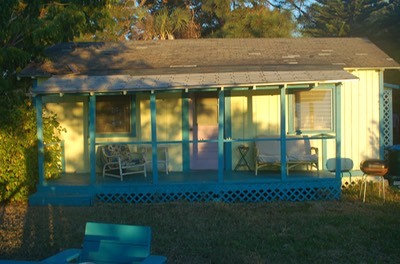 Mermaid Landing was definitely funky – not your typical cookie cutter motel. But it was just the place a couple of guys could relax in after a day of paddling. 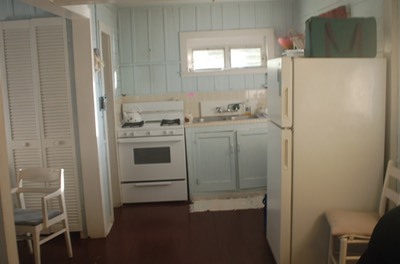 It was clean and had an adequately equipped kitchen, sleeping and dining areas, air conditioning and heat and best of all, porches front and back where we could dry out our gear while we sat and watched the sun rise and set. Cedar Key is on Florida’s “Hidden Coast”. It is a remote, rural fishing village on the Gulf of Mexico. As shirts in the T-shirt vendor’s windows proclaim, “Cedar Key: A Small Drinking Village With a Fishing Problem!” You have to want to be going to Cedar Key to get there. There is no way to just “pass through”. It lies twenty-seven miles down SR24, a turn off of US19 in Otter Creek. SR24 ends at the Gulf of Mexico in Cedar Key. 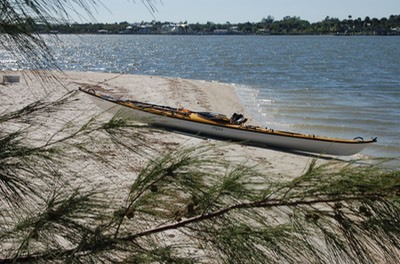 We planned to spend five days paddling around Cedar Key. We actually only got in three days of paddling because of the weather. Heavy rain on our first day had us reviewing our charts and paddling books for possible paddling locations, then driving to put-ins so that we could assess their quality and be able to find them easily when the weather changed. Even though the weather was cool, often gray and windy, we were able to paddle on Monday, Tuesday and Wednesday. 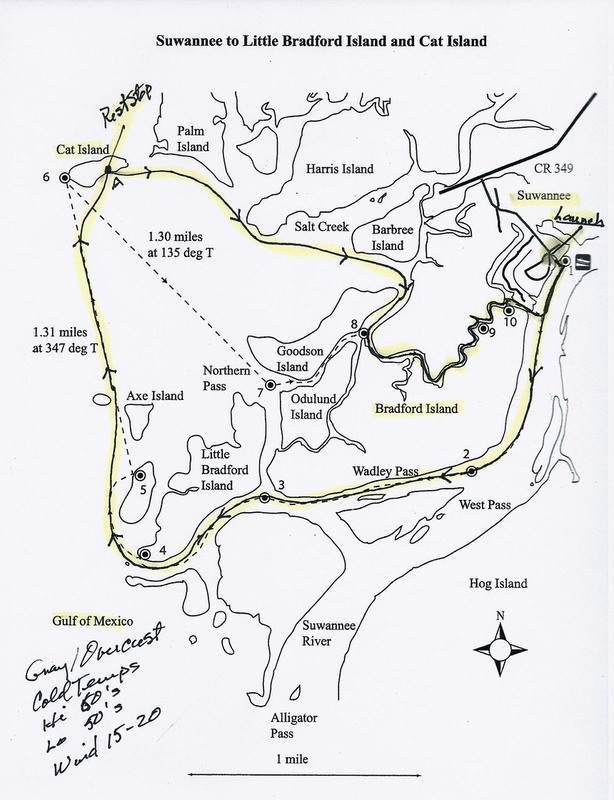 Our trips were Town of Suwannee to Cat Island (Round Trip), Shell Mound to Deer Island (Round Trip) and Purvis Landing to Manatee Springs (Take-out at Fanning Springs State Park- One Way). These three trips will be summarized below. The Town of Suwannee lies at the spot where Stephen Foster’s Suwannee River enters the Gulf of Mexico. Reaching Suwannee is similar to reaching Cedar Key; you really have to want to be going there. Just head west on CR 349 after a turn off of US 19 in Old Town. Twenty-three miles later you’re in Suwannee. CR 349 dead ends at the Gulf of Mexico, so if you get that far, you are in Suwannee. 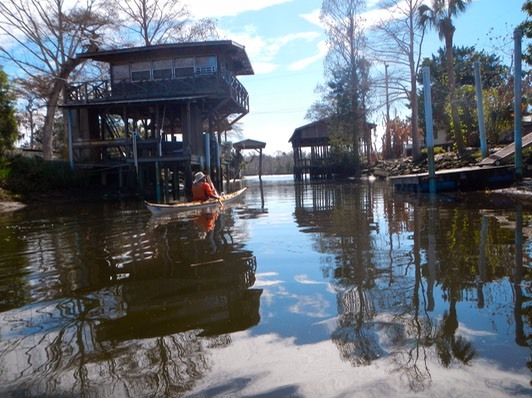 Suwannee is an interesting little town, mostly focused on commercial and recreational fishing. The land there is so flat, low lying and surrounded by water that all houses must be built on pilings some eighteen feet off the ground. This is startling at first. But experience has shown that the worst Gulf hurricanes can create a storm surge at least this high. The launch site is a small ramp off of Bradford Road. (Find Bradford road near the end of CR 349). Instead of following the road off to the right, stay left to find the launch spot (GPS: N290 18.240, W830 10.348) There is limited parking there for a few cars, less if vehicles have boat trailers. 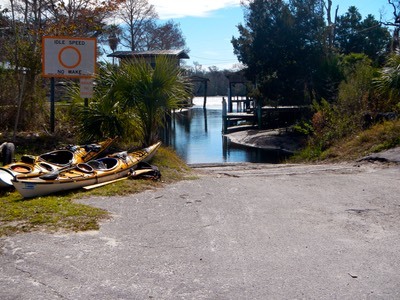 You launch into a small picturesque creek and paddle a short distance to the Suwannee River. I have taken the liberty of adding our route to the Crowhurst’s map and have included it here. 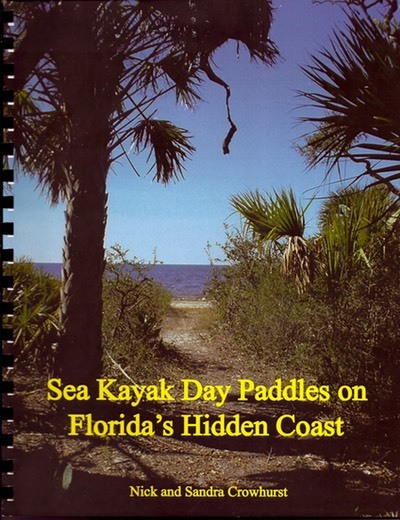 Our route as shown on this map from Sea Kayak Day Paddles on Florida's Hidden Coast, Page 19. 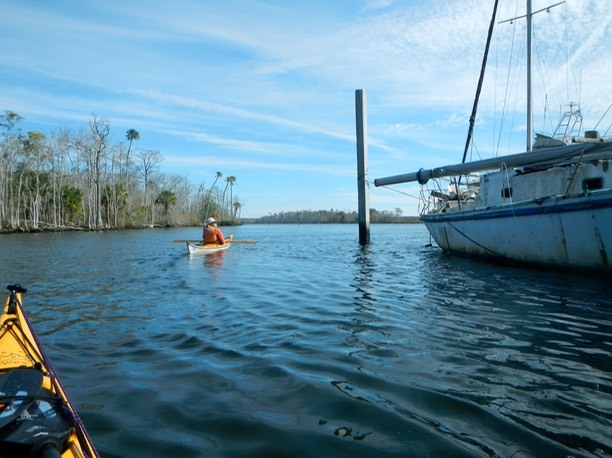 Our route took us down the Suwannee River, around the south side of Bradford and Little Bradford Islands and into the Gulf. 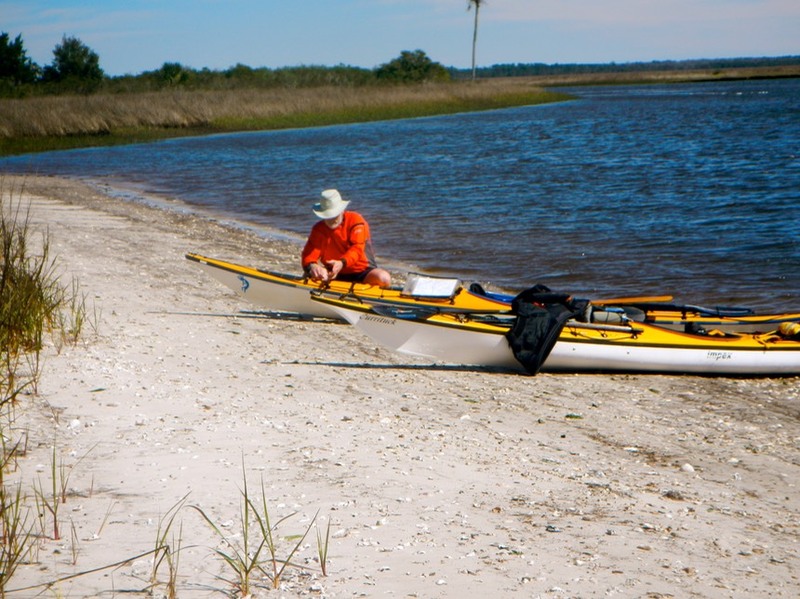 Entering the Gulf, we paddled north past Axe Island, making a rest stop at Cat Island (GPS: N290 19.711, W830 10.585). Then we paddled southeast along the shore of Palm Island and Harris Island, past the entrance to Salt Creek and the tip of Goodson Island. There we entered the narrow winding passage between Bradford Island and the mainland (GPS: N290 19.291 W830 09.270), before returning to the launch site. Our GPS showed a distance of 9.24 miles with a moving time of 3hr. 13mn. Our weather was mixed, partly sunny with cool temperatures and lots of wind (15-20 MPH) on the Gulf. 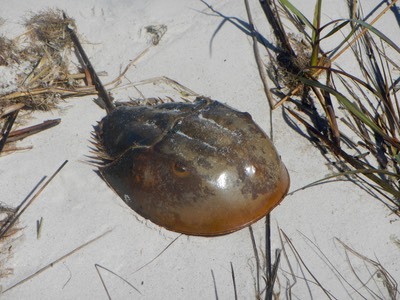 One of the things we found on this paddle was that the Gulf is wide open, often windy and sort of monotonous. 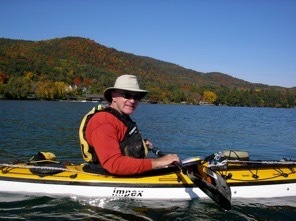 Bruce and I prefer to paddle close to shore where we can see plants and animals and human artifacts. So on our return to the launch site, we continued on up river for a while to see what interesting things we could find.